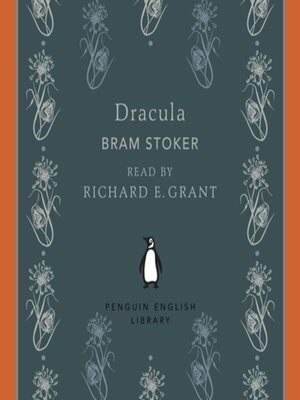 Penguin Classics presents Bram Stoker's Dracula, adapted for audio and available as a digital download as part of the Penguin English Library series. Read by the actor Richard E. Grant. 'Alone with the dead! I dare not go out, for I can hear the low howl of the wolf through the broken window'A chilling masterpiece of the horror genre, Dracula also illuminated dark corners of Victorian sexuality. When Jonathan Harker visits Transylvania to advise Count Dracula on a London home, he makes a horrifying discovery. Soon afterwards, a number of disturbing incidents unfold in England: an unmanned ship is wrecked at Whitby; strange puncture marks appear on a young woman's neck; and the inmate of a lunatic asylum raves about the arrival of his 'Master', while a determined group of adversaries prepares to face the terrifying Count.Part of a series of vintage recordings taken from the Penguin Archives. Affordable, collectable, quality productions - perfect for on-the-go listening.